The average American eats 165 pounds of added sugar every year. Seniors who have diabetes as well as those trying to lose weight can still enjoy sweets without the calories or health risks. Here are some of the best sugar substitutes seniors can enjoy–including some with added health benefits—recommended by the experienced Albuquerque in-home caregivers at Home Care Assistance. You have likely heard of stevia, the safe all-natural sweetener sold under brand names like Truvia. Reb A is one type of sweetener made from the stevia plant and it’s the sweetest of all stevia components. Reb A (sold under the name Pure Via) is 200x sweeter than sugar, which means a little goes a very long way as a 0 calorie sugar substitute. If you want the flavor of real sugar without the heavy processing, consider swapping out white sugar for rapadura sugar. This unrefined cane sugar is less processed, so it contains more molasses, minerals, and vitamins. Rapadura is also a good source of calcium, magnesium, phosphorus, potassium, niacin, and vitamins A, B1, B2, and B6. Because it’s made from cane sugar, it still has the familiar caramel taste to add richness to marinades and baked goods as well. Erythritol is a nearly guilt-free sugar alcohol that the FDA recognizes as safe. Erythritol is used as a bulk sweetener for reduced calorie foods, and it’s found naturally in pears and other fruits. This white powder has just 0.2 calories per gram and it won’t cause tooth decay or high blood sugar. Because it isn’t as sweet as sugar, it’s best used in baked chocolate treats like brownies. Applesauce is the perfect substitute for sugar in baked goods. Swap out the white sugar for an equal amount of applesauce in cookies and other recipes to dramatically lower the number of calories without sacrificing sweetness. A cup of sugar has more than 700 calories while one cup of applesauce has just 100, along with plenty of fiber, minerals, and vitamins. Raw honey boasts a powerful antioxidant punch to help fight colds and infections. You can use raw honey instead of sugar in everything from smoothies and salad dressings to teas and oatmeal. 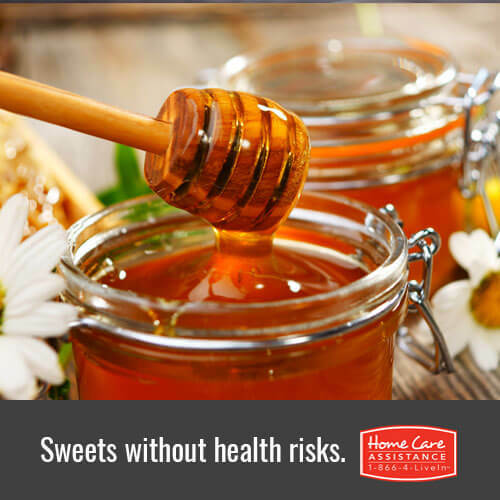 Use slightly less honey than you would sugar, as it’s sweeter than cane sugar. Learn more about promoting senior health and wellness from the dedicated staff at Albuquerque Home Care Assistance. Through our Balanced Care Program, we support a high quality of life by emphasizing the value of nutrition, daily exercise, social activity, and maintaining purpose. For more information, call a friendly Care Manager at 505-798-0800 and request a complimentary consultation. Senior Health: Are Fiber Supplements Safe?